Tried and true. Simple and elegant. Flowers for mom are a great Mother's Day Gift. 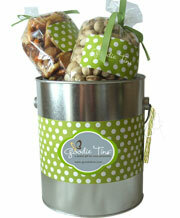 Personalize this Goodie Tin with a sweet note of love for Mom. This Mother's Day Goodie Tin comes with fluffy hydrangeas in the crisp and classic spring floral design. Fully wrapped and ready to gift. Goodie Tins, the more sophisticated cousin of the gift basket.